These tacos take little cooking time and mostly chopping. Get dinner or lunch ready without much fuss. Place fish fillets on baking sheet and drizzle with avocado oil, lime juice, and sprinkle with salt, pepper, and chili powder. Bake at 375° F for 15 minutes, turning once half way through baking. Let fish cool and then flake with fork and set aside. To prepare filling, seed and dice tomato, dice avocado and mushrooms, chop cilantro, shred zucchini. Mix vegetables together and add juice of ½ lime and ½ lemon. Add dried oregano, salt and pepper to taste. 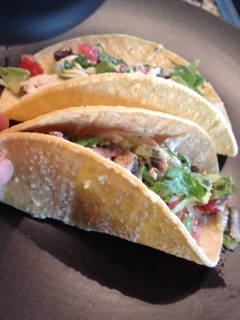 Assemble tacos by layering fish on shells and adding veggie mixture on top. Note: If you prefer, eliminate taco shells and add fish and veggies to bed of lettuce or spinach. Add extra olive oil and lime juice.